KATHMANDU, August 6: Less than nine months after the unification of Rastriya Prajatantra Party, the party has split into two factions on Sunday with a disgruntled faction led by senior leader Pashupati Shumshere Rana seeking registration of a new party at the Election Commission (EC). "A group of leaders from RPP have applied for registering a new party called Rastriya Prajatantra Party Prajatantrik," said Election Commissioner Surya Prasad Sharma. Ghanshyam Ojha, under-secretary at the EC's legal division, informed that altogether 75 leaders including 22 lawmakers have signed in the application submitted to the EC. "By going through their document, it seems that more than 40 percent of lawmakers and central leaders have applied for the registration of new party," said Ojha. By the time when this story was filed, signature verification of the party's leaders and lawmakers was underway at the EC. "They are still coming with signatures. The registration process is still underway," he said. According to parliament sources, lawmakers Deepak Bohara, Bikram Pandey, Sunil Bahadur Thapa, Resham Lama, Babina Moktan, Liladevi Sharma, Parshuram Tamang and Rajya Laxmi Shrestha have supported Rana's new party. Similarly, lawmaker Laxmi Thapa Paswan, Rajeshwari Devi Sah, Ram Kumar Subba, Anandi Pant, Istiyak Ahamat Khan, Geeta Singh, Sadar Sharma and Biraj Bista among others have also severed their ties with RPP. RPP Chair Kamal Thapa termed the decision to split the party as 'unfortunate' and called on party cadres to maintain restraint. "Most of the signatures are doctored. 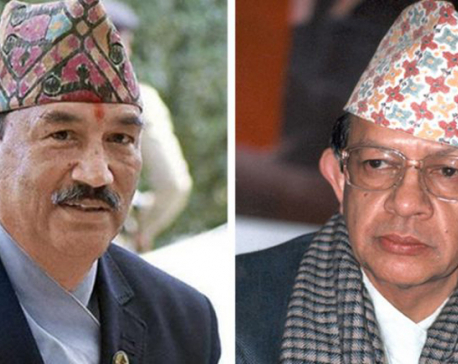 I call all party leaders to have restraint," Thapa wrote on Twitter. Rana-led Ratriya Prajatantra Party (RPP) and Kamal Thapa-led Rastriya Prajatantra Party-Nepal (RPP-Nepal) had unified last November. However, internal disputes among the top leaders led the splitting of the party within nine months after the unification. The party had 37 lawmakers in the House after the unification on November 21 that included 24 from Thapa-led RPP-Nepal and 13 from Rana-led RPP.